At Bougainvillia Holiday Park we have a range of accommodation to suit all budgets. The accommodation ranges from cabins, airconditioned holiday units, a great choice of shady tent sites and large powered and delux ensuite sites. Situated on the beautiful Noosa River, this delightful small holiday complex captures the tranquility of this peaceful place. Wide open grassed parkland is the only thing that separates us from the river. Blending the charm of East meets West colonial architecture with the finest fixtures fittings and facilities, the Colonial Resort Noosa stands unrivalled as the ultimate in refined luxury holiday accommodation. Coral Beach Resort offers the perfect combination of lifestyles. Holiday guests can take in the relaxing charm of the Noosa River and its surrounds or the excitement of nearby Noosa Heads. Dolphins Beach House at Sunshine Beach . Known as the best budget accommodation option in Noosa and located only 5 minutes from Noosa's town centre and 200 metres from beautiful Sunshine Beach . You will find our breezy Guatemalan design and shady outdoor areas provide you with the perfect retreat after a days touring or beachcombing. Experience the peace and tranquility of a country retreat in an outstanding coastal location and escape to this unique lakefront destination. Enchanting, private traditional cottages and contemporary Noosa style pavilions nestled on the shores of this beautiful lake amongst 50 acres of unspoilt bushland. This resort offers privacy and exclusivity less than thirty metres from the beach and right on Hastings Street, the lively streetscape that has made Noosa one of the world's most desirable holiday destinations. Glen Eden's absolute beach front position is peacefully situated behind the dunes at Peregian Beach. The natural vegetation on the coastal strip abounds with flora and fauna. Boasting luxury bed and breakfast accommodation, large self-contained studios, corporate meeting room, tennis court, solar-heated swimming pool, Jacaranda Creek Farmstay B&B is a luxury retreat awaiting the most discerning guest. L'Auberge offers boutique style one bedroom apartments in a complex with a quiet mediterranian ambience within easy strolling distance to Hastings Street. Ideal destination for couples. Lake Weyba Cottages is an idyllic natural setting on 20 parkland acres with lush green lawns and tropical gardens on the Sunshine Coast. Your hosts Philip and Samantha Bown have a wealth of hospitality experience in Europe and Australia. 4 ½ star luxury accommodation for the discerning traveller seeking comfort and first class service in a peaceful & tranquil environment. Three luxury suites beautifully furnished and decorated, situated in a pastoral setting overlooking the open countryside just minutes away from Eumundi's famous market. Spacious, air conditioned 2 bedroom, 2 bathroom fully self contained apartments. Large heated swimming pool and hot spa set in central garden. Nautilus Noosa is a quality, affordable 3 ½ star resort offering spacious accommodation, in 2 bedroom townhouses or villas. 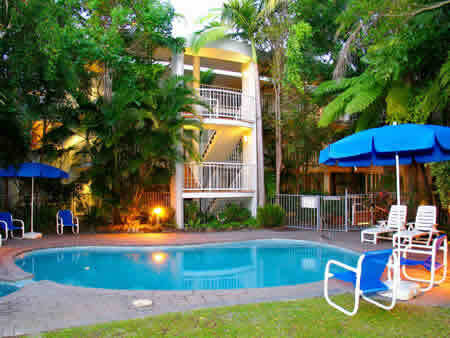 The resort is ideally located between Hastings St and the Noosa River restaurant precinct at Gympie Terrace. 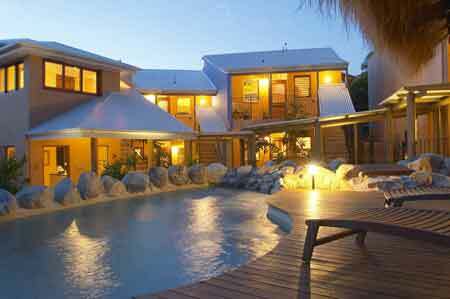 Noosa Blue Resort is Noosa’s most stylish boutique resort. Perched high on Noosa Hill, the resort’s commanding position offers magnificent hinterland and Noosa coastal views. Nestled cosily amongst four acres of tropical waterfront gardens in tranquil Noosa Waters, Noosa Entrance Waterfront Resort is one of Noosaville’s best kept waterfront secrets.Stay with us and discover what it’s like to enjoy a true waterfront holiday in Noosa! 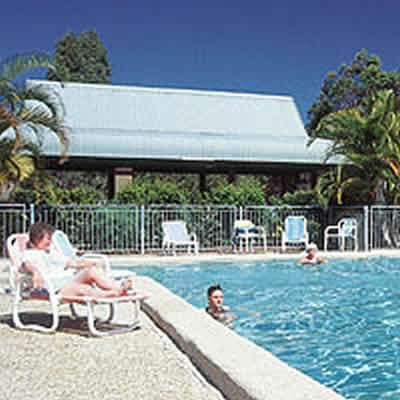 Noosa Keys Resort is close to the Noosa River and only a few minutes from Hastings Street. Noosa Keys has modern 2 and 3 bedroom family apartments with facilities and services to accommodate all your holiday requirements. Nestled between lush, green rainforest and azure Pacific Ocean, you'll discover a place that leaves the everyday behind. Noosa Springs, where nature and style come together to create the ultimate sanctuary. Enjoy the romance and elegance of this superb 4 ½ star bed and breakfast retreat, offering genuine service and hospitality with four luxury ensuite rooms, individually decorated and with French doors opening to verandahs overlooking the award winning tropical gardens abundant with native wildlife. On The Beach Noosa’s stunning natural elements are the very essence of On The Beach, where you will feel the magic of Noosa from the first moment you arrive. Located on the sandy foreshores of Laguna Bay. Conveniently located at beautiful Peregian Beach on Queenslands' magnificent Sunshine Coast south of Noosa. Relax... enjoy... unwind. The mantra for Sheraton Noosa Resort and Spa, the perfect getaway, blessed with spectacular beaches, languid rivers and idyllic rain forests. The Resort enjoys an ideal location, on fashionable Hastings Street. Surrounded by a tropical landscape, Sunshine Vista apartments are located only minutes from the golden sands of Sunshine Beach. Your Sunshine Vista apartments lends you to an ideal holiday lifestyle whether it be swimming, surfing, or enjoying the cafe and restaurant scene close by. Tingirana Noosa offers a very special blend of beachfront location luxury and enviable lifestyle. In the heart of Hasting Street. Noosa's only five star serviced apartments set a new standard in premium accommodation with friendly service. Award winning Mediterranean style holiday complex of eight, 2 & 3 bedroom luxury apartments on Noosa Sound overlooking the Noosa River. Situated in the most sophisticated and beautiful part of Noosa with its exclusive homes and apartments “The Cove” at Little Cove enjoys an extraordinary position 30 metres from the ocean at Little Cove Beach. The Hastings Noosa consists of a unique concept of 25 individual villas set in a rainforest environment. Perfectly located at Sunshine Beach and just 30 mins from the Maroochydore Airport, Sundancer Holiday Apartments offer high quality 4 star accommodation in quiet and peaceful surroundings and only minutes drive from the exciting atmosphere that has made Noosa's Hastings Street famous. Situated in an elevated position overlooking Hastings Street in the heart of Noosa, The Lookout consists of 21 beautifully furnished apartments in tropical gardens. Contemporary luxury and coastal living, Rise apartments are set on a hillside location overlooking the peaceful haven of Noosa Heads. Rise is only minutes away from the hub of restaurants, boutiques, bars and cafes. We also have a good listing of Noosa holiday homes which you will enjoy browsing. And if you are looking elsewhere please browse our Sunshine Coast Accommodation.